Bonnie Marris Hand Signed Limited Edition Canvas Giclee:"Born To Be Wild"
Size: 28"w x 21"h. and 40w" x 30h"
Edition: Artist Handsigned and Numbered to 50 with 10 Masterwork Editions. COA Included. 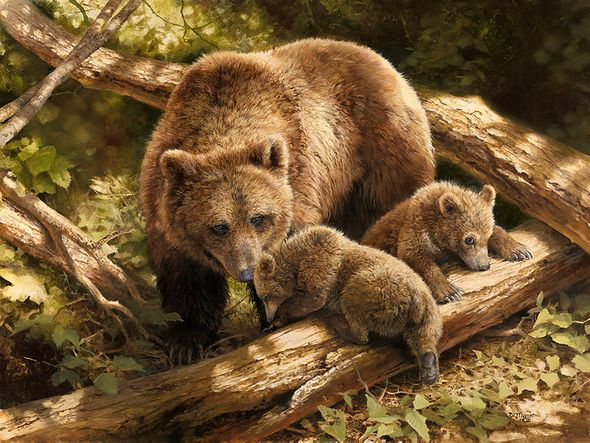 About the Artist : Wildlife artist Bonnie Marris' fascination with animals began at an early age when, at the age of two, she spent hours in front of the wolf cage at the zoo, enraptured by the animals within. The attention to detail evident in her work is a consequence of long hours studying her subjects in the field and her background in illustration. Bonnie Marris has taken an unusual path into art; she developed her talent by portraying animals "from the inside out." While she was a student at Michigan State University, Bonnie illustrated several major books. One volume she worked on was a leading expert's mammalogy text that contained several hundred drawings and detail studies. This massive project attracted the attention of noted zoologist George Schaller, who invited Bonnie to prepare the art for posters that would support his worldwide rare animal relief programs. In addition to her accomplished skill at rendering her subjects and evident affinity for the wild, Marris' painting requires frequent and substantive field experience. Each year, Bonnie makes two major trips, and countless smaller ones, to observe and learn about the wildlife she loves. In 1980, one such voyage took her to Alaska, where she lived in the wilderness for six months. She recounts, "To get into a natural environment and see the animals on their own terms is as important as knowing the animals themselves. For instance, gray wolves on the tundra-the vast, vast tundra with the wind and other forces of nature at their most extreme-that's what makes them what they are. To stand not far from a grizzly that is so overpowering, so beautiful and so large . . . to watch it pull up a small tree with a swipe of its paw and just a few minutes later see it delicately picking blueberries with its black lips. . . Alaska changed me; it gave me the biggest incentive to paint and increased my interest in the predators: the cats, bears, coyotes, wolves and foxes. They exist on so many levels. Their moods show in their eyes and we can learn so much from them." Marris' works were selected for the 2002-2005 Gene Autry Museum of Western Heritage Show.